9" x 12" or 12" x 18" Sign CUSTOMIZE THIS SIGN! 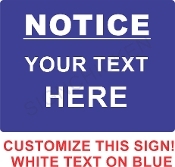 Customizable Horizontal / Vertical CUSTOMIZE THIS SIGN! Customizable Horizontal Sign CUSTOMIZE THIS SIGN! Customizable Vertical Sign CUSTOMIZE THIS SIGN! Emergency Equipment Located Here Emergency Horizontal Sign CUSTOMIZE THIS SIGN! Emergency Red Text on White CUSTOMIZE THIS SIGN! Emergency Sign w/ Stripes CUSTOMIZE THIS SIGN!